It says a tribunal would be "the most effective method". 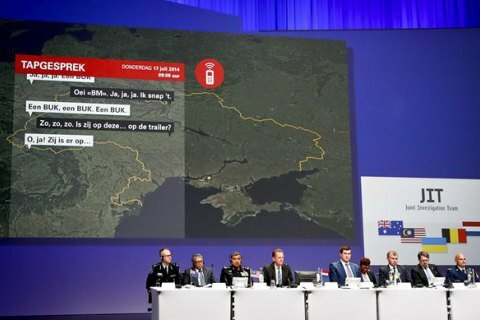 The publication of the the preliminary results of the criminal investigation into the downing of Malaysian Airlines flight MH17 is an "important milestone" towards bringing to justice all those responsible for downing the aircraft, the Ukrainian Foreign Ministry said in a statement on 28 September. "Today’s report also includes a new and very important element: information about the route of the weapon, via which it was transported to Ukraine from Russia and then moved in the opposite direction through a sector of the Ukrainian-Russian border controlled only by Russia and its militants," the ministry said. "This information once again points to the direct involvement of the state-aggressor in downing the aircraft. An investigation into specific suspects’ affiliation and place in the chain of command is ongoing in order to submit the cases to the appropriate court in the near future." According to the Foreign Ministry, the most effective method of prosecution would be to establish an international tribunal under the auspices of the United Nations Security Council. Despite broad international support for this idea, Russia was the only country to veto a resolution on the establishment of such a mechanism in the UN Security Council, it recalled. It added that the states involved in the investigation continue to work to identify the mechanism through which those responsible for the catastrophe will be brought to account.